Vlad III Tepes was a prince of Wallachia, which is found in yellow on the map to the right. 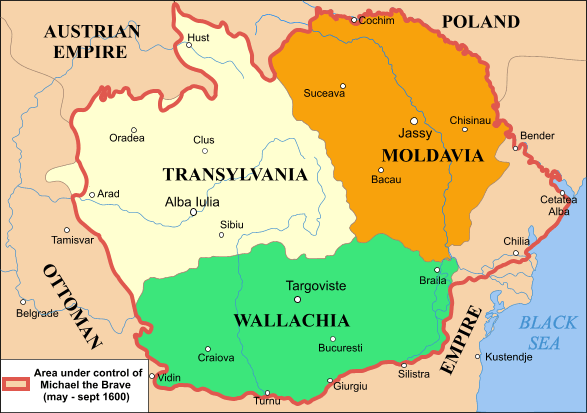 This is where the principality of Wallachia is located- and it along with Moldavia would become the nucleus for the country of Romania. The land is found just below Transylvania, and Vlad's father used it as an area to spend some part of his exile there. This would be the land that Vlad Tepes would one day rule. He would not rule Transylvania, but he would have many dealings with the people there. To get a better idea of why Transylvania was so important to Europe, and to Romania, simply look at the map of about 1600 year that Micheal the Brave unified the three principalities together- before he was killed by enemies. This would be the only time it was unified with Wallachia until 1919. No, Vlad Tepes did not rule Transylvania, he was born there during the time his father had lost his throne. 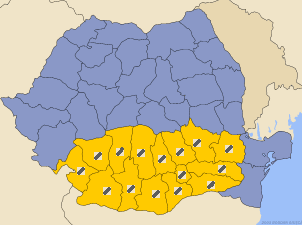 This map is an outline of Transylvania and the Banat and a few other smaller areas, which today are sometimes known collectively as "Transylvania." Although Count Dracula never existed it is within Transylvania that he has made his mark, with many statues and tourist attractions, which have allowed Transylvania to profit-- on a prince whose major contributions to the area was killing men and women there. As for Dracula, he's a money maker, and if this leads people to learn the real history, then this is a good thing. No, vampires do not live in Transylvania.